Interethnic competition in plural societies is often characterized by a ‘counterbalance’ of political and economic strength between different groups. In such cases, tensions emerge as politically dominant groups fear loss of hegemony to more economically aggressive groups. Likewise, economically successful groups require key public goods and a political atmosphere conducive to investment. These social relations are couched in terms of ethnic mythologies that stress the indigenous role of one group, and consequently its superior political status. This book develops a model that explains how and why interethnic bargains between rival groups can erode given different institutional configurations. It is hypothesized that interethnic conflict is more likely in countries where political institutions fail to insulate the political hegemony of traditionally dominant ethnic communities and redistributive programs fail to improve the economic position of ethnic majorities. In such cases, outbidding strategies by more extreme ethnic leaders are more successful and violence becomes more likely. 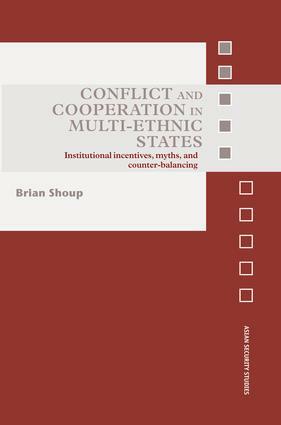 Conflict and Cooperation in Multi-Ethnic States will be of interest to students of ethnic conflict, Asian politics and security studies. Brian Shoup received his PhD from Indiana University, where he is now the Assistant Director of the Indiana Democracy Consortium.